Ballymena United's Cathair Friel netted at the Brandywell. SECOND half goals from Cathair Friel and James Knowles ensured Ballymena United made it three wins in eight days. 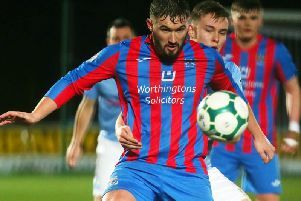 Despite Joe McCready's late goal for Institute, United held on and moved into fourth spot in the Danske Bank Premiership. For Paddy McLaughlin's side for the third home game in a row defensive lapses and failing to take chances, meant they suffered another harsh lesson in the top flight. Institute made two changes to their side which defeated Ards last week, with Callum Moorehead and Ronan Wilson coming in for Gareth Brown and Stephen Curry. As for the visitors young Leroy Millar was celebrating his 100th appearance for the Braidmen. The home side started on the front foot with both Moorehead and Jamie McIntyre causing problems for United, in fact Scott Whiteside was fortunate not to get cautioned early on after upending the latter on the edge of the box, fortunately for the United centre-back Aaron Harkin's resulting free-kick flew well over. Both sides were forced into changes just after the mid-way point of the half with Stephen Curry coming on for McIntyre, after the winger fell awkwardly, while Tony Kane replaced Jude Winchester, who also picked up an injury. United were inches away from taking the lead just before the half-hour mark as Kofi Balmer's cut-back found Adam Lecky, but the big striker's back-flick from close range was kept out by a diving Marty Gallagher. On 42 minutes the woodwork came to 'Stute's rescue as a poor clearance by Dean Curry fell perfectly to Lecky, but his close range strike, which had Gallagher beaten, clipped the post. Right on the stroke of half-time United missed another super chance to break the deadlock as Lecky's lay-off found Friel, but the former Limavady United striker blasted over from 10 yards. Institute started the second half in positive fashion and should have taken the lead on 46 minutes but after linking well with Michael McCrudden, young midfielder Wilson watched his close range strike, which had keeper Ross Glendinning beaten, clip the crossbar. United took the lead in controversial circumstances as referee Keith Kennedy felt that Dean Curry had fouled Lecky on the half-way line and from James Knowles' resulting free-kick he picked out an unmarked Friel, who gleefully headed home from close range. Minutes later Ronan Doherty was inches away from levelling things but the midfielder's curling effort with his weaker right foot, whistled just past Glendinning's left hand post. Ballymena had strong claims for a penalty moments later after Caoimhin Bonner seemed to handle the ball inside the box, but referee Kennedy waved play-on. United added a second on 71 minutes from the penalty spot after Knowles made no mistake from the 12 yards, after Kofi Balmer seemed to go down very easily under McCrudden’s challenge. On 85 minutes Friel went close to adding his second of the day, but his close range header, rattled the crossbar. Deep into stoppage time Institute pulled a goal back as Doherty's fantastic pass found McCrudden, who in turn saw his low cross find substitute Joe McCready and he made no mistake from close range. Institute: Gallagher, Jarvis, Bonner, D Curry, McLaughlin; Doherty, Harkin (McCready 75), Wilson (Morrow 63); McIntyre (S Curry 25), McCrudden, Moorehead. Ballymena United: Glendinning, Whiteside, Friel, Knowles, McCullough, McGrory, Balmer, Winchester (Kane 27), Ervin, Lecky, Millar.